Product information "High Speed HDMI-Cable 3 Meter white"
HDMI-Plug 19 pol. to HDMI-Plug 19 pol. The 2 meter HDMI cable with gold plated contacts is of course ideal for Full HD, 1080P and 3D playback. The cable have a 2-fold shielding to guarantee a trouble-free audiovisual transmission. The cable supports HDCP and is HDMI 1.4 compliant. 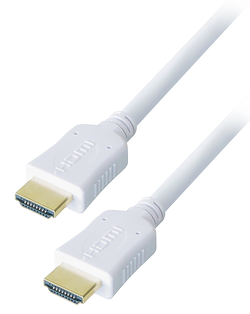 Related links to "High Speed HDMI-Cable 3 Meter white"